Storey Publishing, LLC, 9781612120287, 288pp. From Pacific salmon and Dungeness crab to wild mushrooms, cherries, apples, saffron, and much more, the Evergreen State’s diverse food traditions shine in this guide to Washington’s cuisine. Diverse recipes include Roasted Sockeye with Warm Orange and Olive Salad, Yukon Gold Potato Pizza, and Dark Chocolate Cake with Figs, Fennel, and Pistachios. 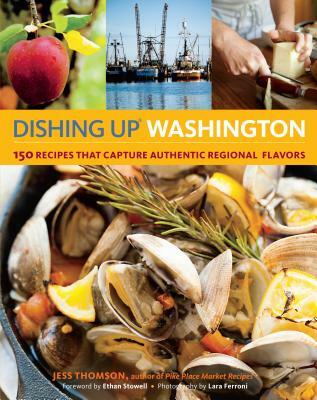 You’ll also find inspiring profiles of Washington’s local food producers. With abundant seafood, fertile farmland, and award-winning vineyards, Washington has the ingredients for a deliciously varied culinary experience. Jess Thomson is a food writer based in Seattle. Her work regularly appears in Sunset, Seattle Metropolitan, and Edible Seattle. She is a regular guest on Seattle’s NPR station, KUOW.